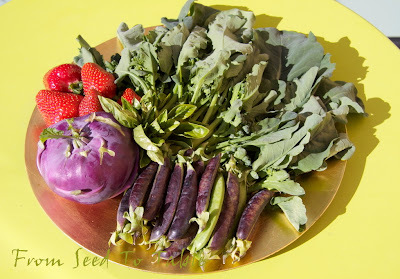 That's the harvest from last Friday, one last Azur Star kohlrabi that was hidden under the floppy fava foliage, a few strawberries, Piracicaba shoots, Sugar Magnolia purple snap peas, and some basil. 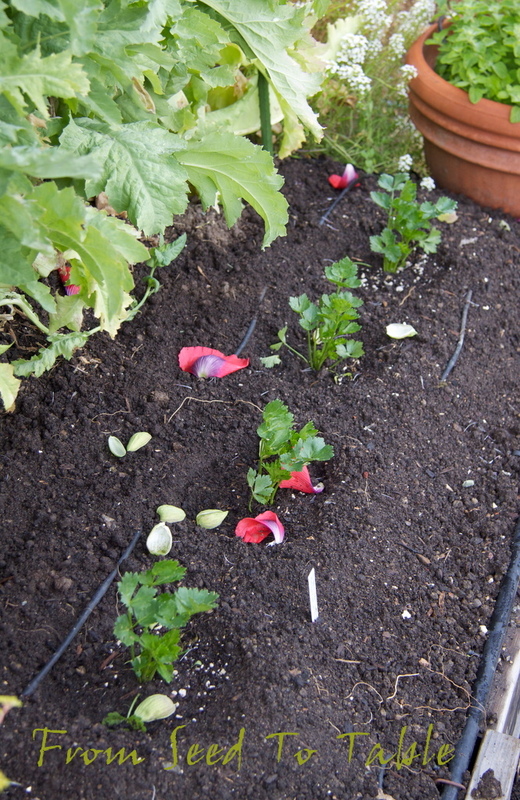 I also pulled out a couple of fava plants yesterday to make way for a planting of pole beans. 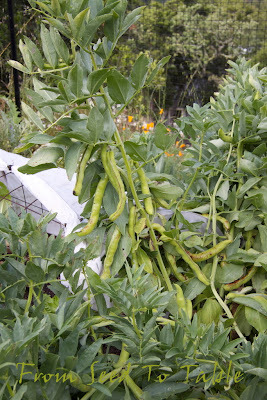 If it weren't for the favas the harvest total would be much lower than usual since I didn't cook much last week. And not included in the totals below are 4 heads of garlic, 3 of which were roasted and smeared on toast as an appetizer, yum. The week before last I harvested a lot of beets, enough to fill 3 quart jars with pickles and still have leftovers. Here's a picture of one of the jars of pickles that I opened this weekend to sample, it's almost half gone now. . . 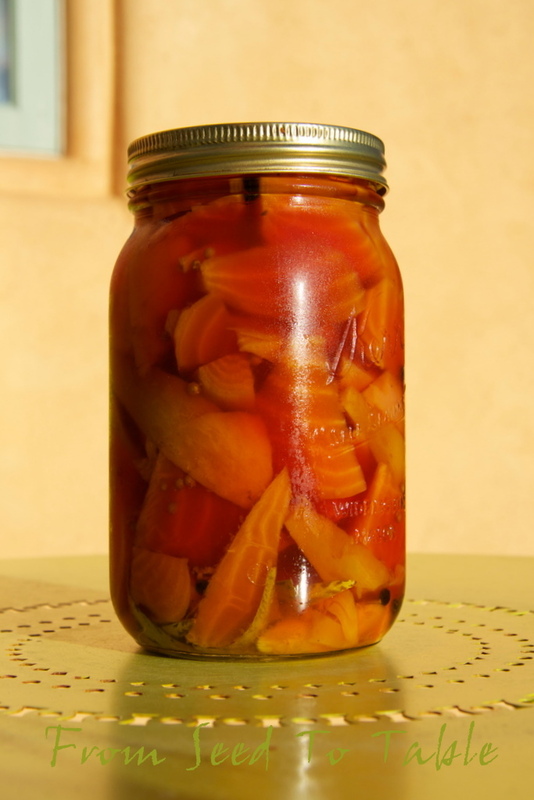 This jar is a mix of Chioggia and Golden beets, the other jars each contain a single variety of beet. 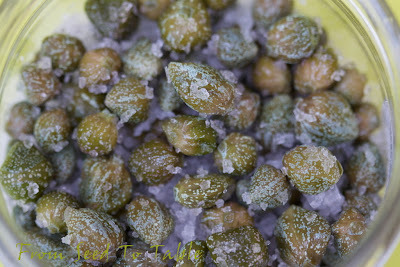 Fava beans - 4 lb. 9 oz. Total for the year - 212 lb. 11.25 oz. 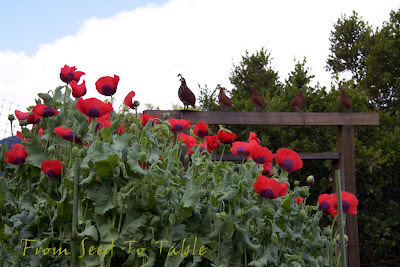 There are a lot more harvests to see at Daphne's Dandelions, the home of Harvest Monday, go check it out. It's been less than a month since the last garden tour but wow have some things grown, some things are gone, and new plants have been set out or set back. The month of May has been rather cool and unusually moist, conditions that the spring veggies are mostly liking and the summer ones are resenting. 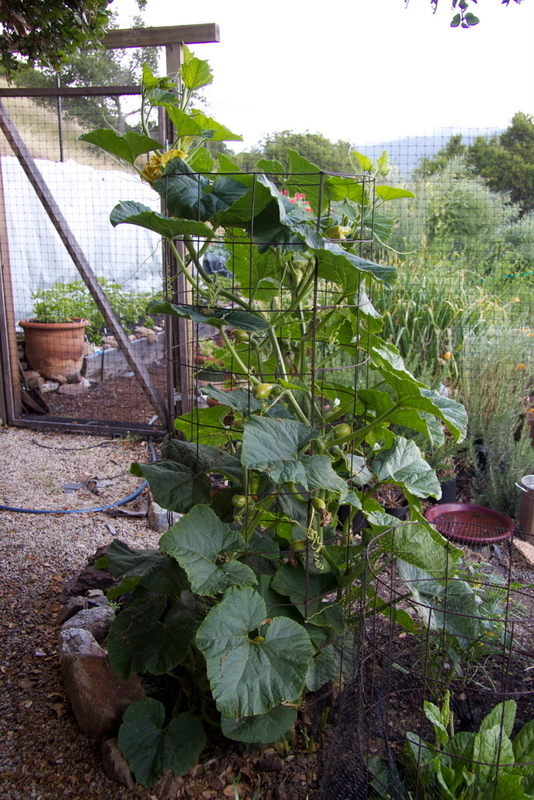 Let's start with the mutant squash that volunteered outside the garden. This crazy thing has doubled in size and is covered with female blossoms, but the few male blossoms on the plant refuse to grow and open. 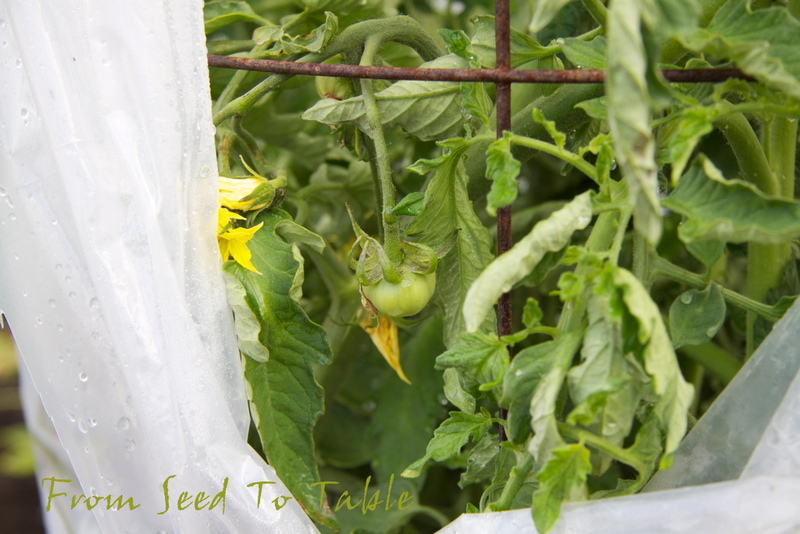 I had it covered for while with netting to keep the deer from munching on it and then I uncovered it, if the miserly thing won't reproduce properly then it's going to be a treat for the deer. But do you think the deer have snacked on it? 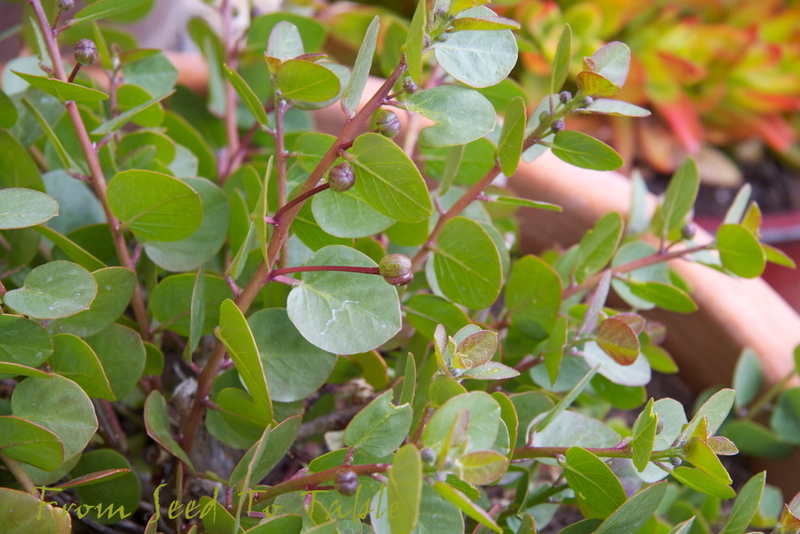 Nooo, they decided to munch on the sorrel plant that is sitting right next to it. 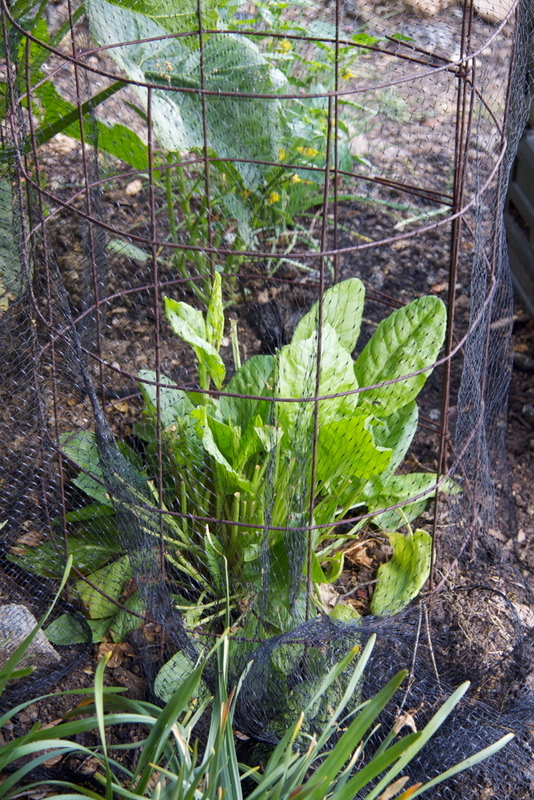 Oh well, now I know that the deer love sorrel. 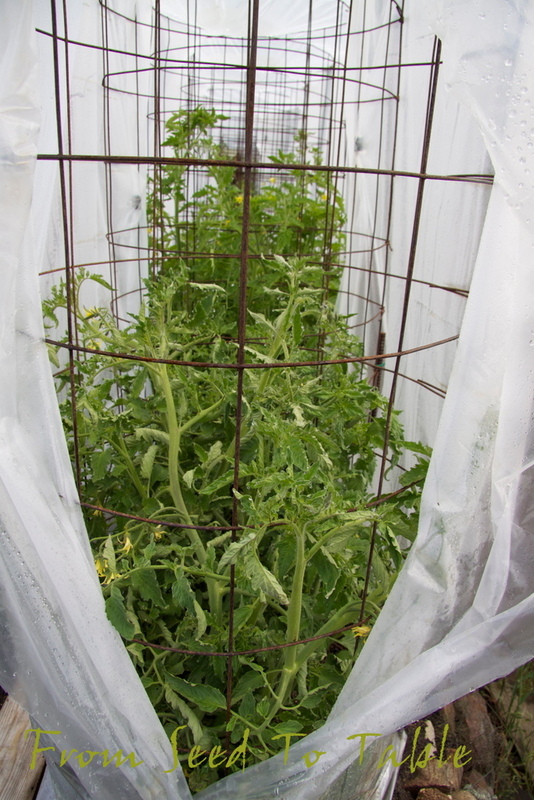 It's now recovering in a net covered cage awaiting another transplant. 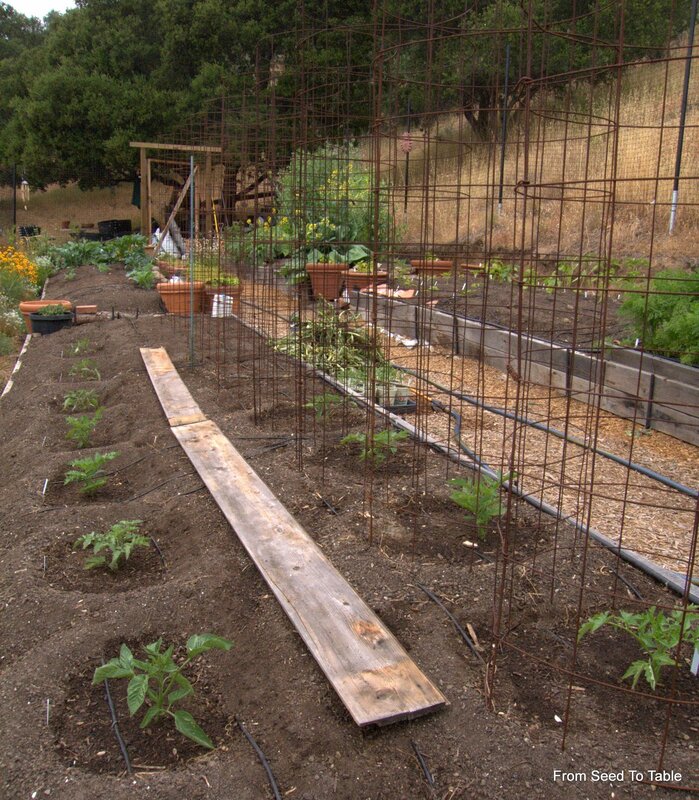 Inside the garden proper, here's the garlic patch. Some of it is turning prematurely brown because of a sudden outbreak of . . .
rust *sigh*, I thought maybe I was going to escape this nasty infection this year. Last year it hit my garlic bed early and hard and most of the heads came out the size of large cloves. There is no recommended or proven organic treatment for garlic rust but I've found neem oil seems to slow it down considerably. 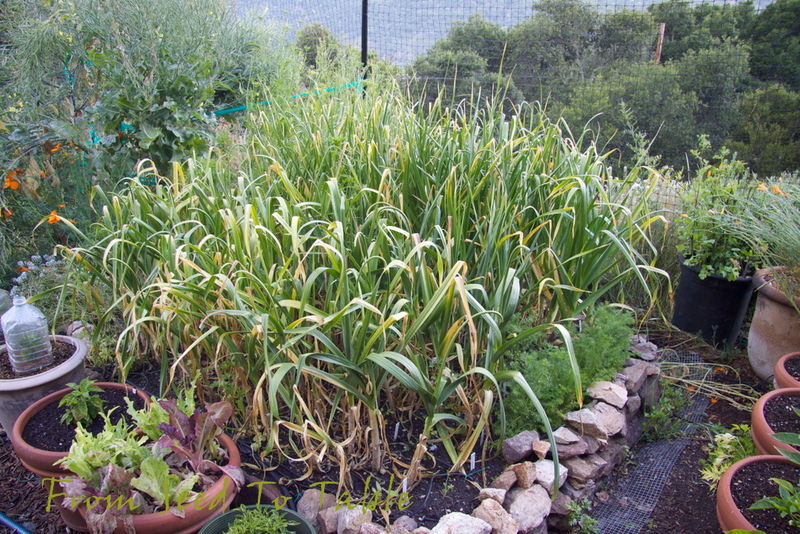 I gave my young garlic plants a treatment early on and then watched and waited. This week I saw the first outbreak of spores. 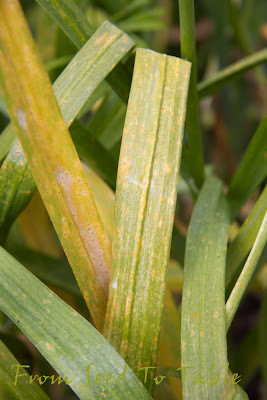 I suspect that the infection was there for quite some time because the leaves had started to turn yellow before I expected them to but there were no spores to be seen until this week. 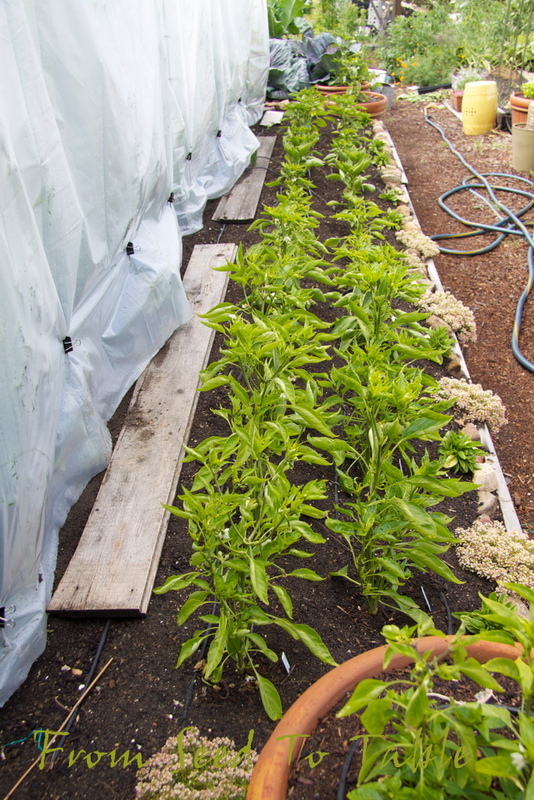 I thoroughly treated the garlic with neem on Wednesday, I'll see how it goes. At least most of the garlic has started to size up nicely so I won't be stuck peeling mini cloves this year. 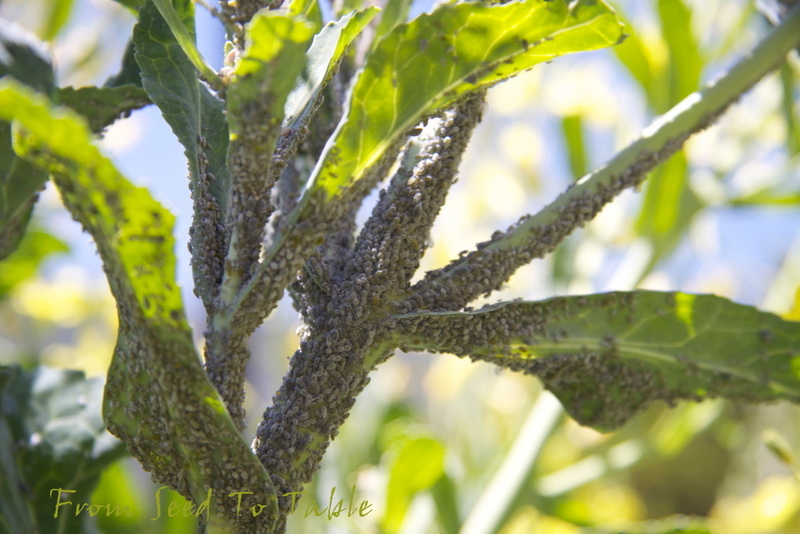 Remember that nasty bunch of aphids in the kale that I showed on the last tour? The hover fly larvae finally got to work and now the infestation is just a bunch of aphid carcasses that have been sucked down to a dry shell. There's hardly an aphid to be found in the garden now. Moving down that bed, here's the Green Beauty and Yellow Giant Snow Peas are starting to bloom and have set a few tiny peas. The Yellow Giant peas don't seem to have yellow peas, I guess it got it's name from it's yellowish foliage. 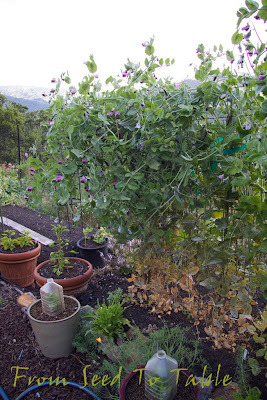 And next to the snow peas, the Sugar Magnolia Purple Snap Peas have topped their trellis and are sprawling all over the place. They are beautiful. 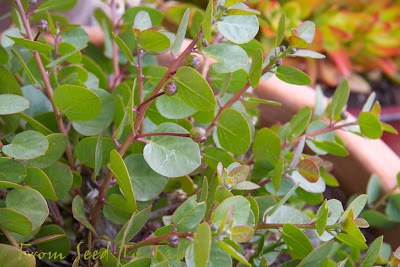 But you can see the brown foliage at the bottom which is caused by powdery mildew. The peas also got a partial treatment with neem. I don't like to spray the entire pea plants when they have pods because the neem can leave a bad tasting residue. The pots with the plants that are covered with water bottle cloches have chinense species peppers growing in them. 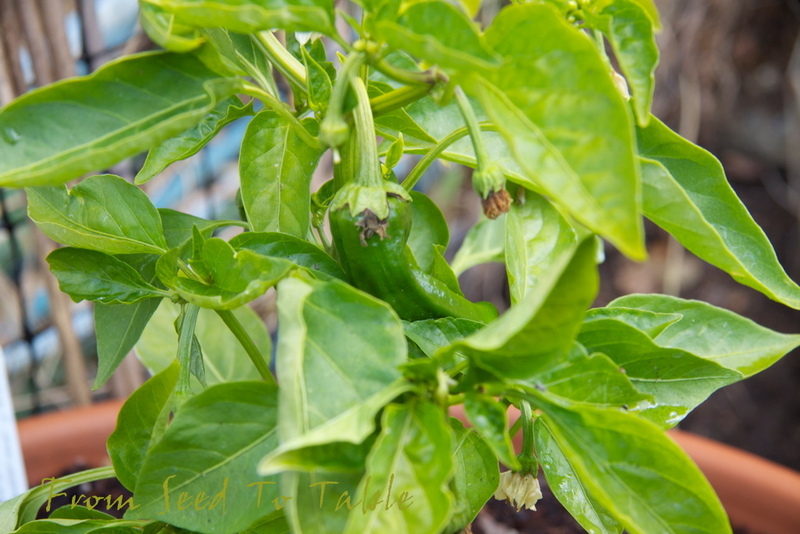 Capsicum chinense are very resentful of cold weather and I have to baby them along early in the season. 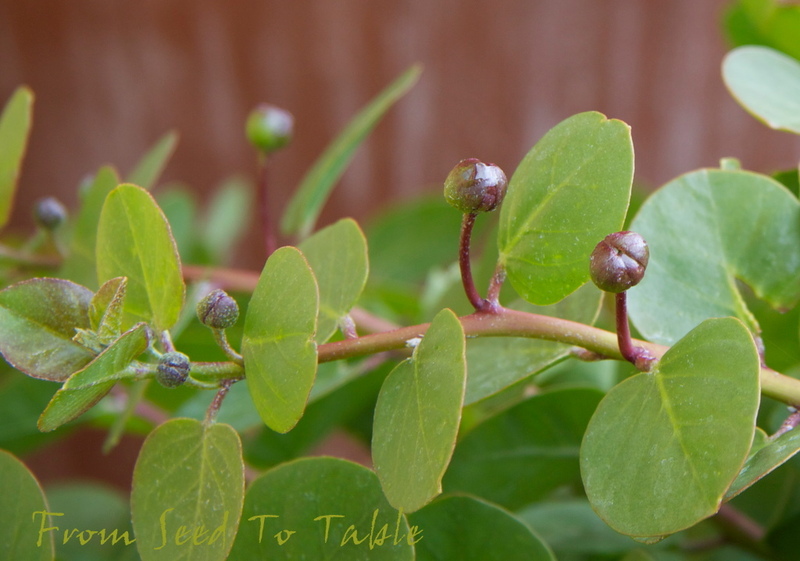 Those purple pods certainly don't get lost in the foliage! 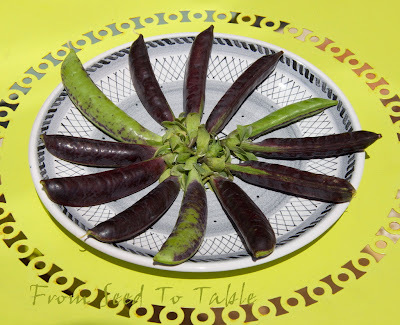 And, I was delighted to find out that they don't lose their color when you cook them until they are crisp-tender. You don't want to overcook them though, I think that they turn gray when cooked until soft, I didn't test that though since I like my snap peas on the crisp side. They were also nice and sweet, even after spending 4 days in the refrigerator. I still have to test these using my favorite method of sautéing them in butter or brown butter and then adding liquid to briefly steam them and then let the liquid cook off so that you get a nice sauce. 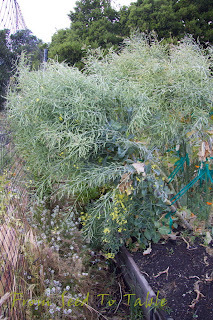 Here you can see the Portuguese Dairyman's Kale (aka Smooth Leaf Kale From the Azores), full of ripening seed pods. I can't wait to get these beasts out of the garden. The are so incredibly floppy. 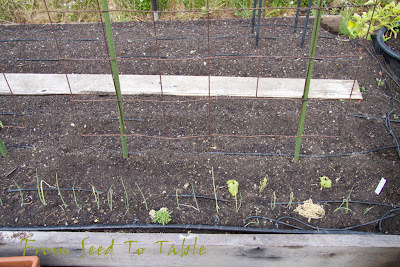 There's I don't know how many stakes in there propping them up and recently I had to tie some of them to one of the fence poles to keep them off the peas. 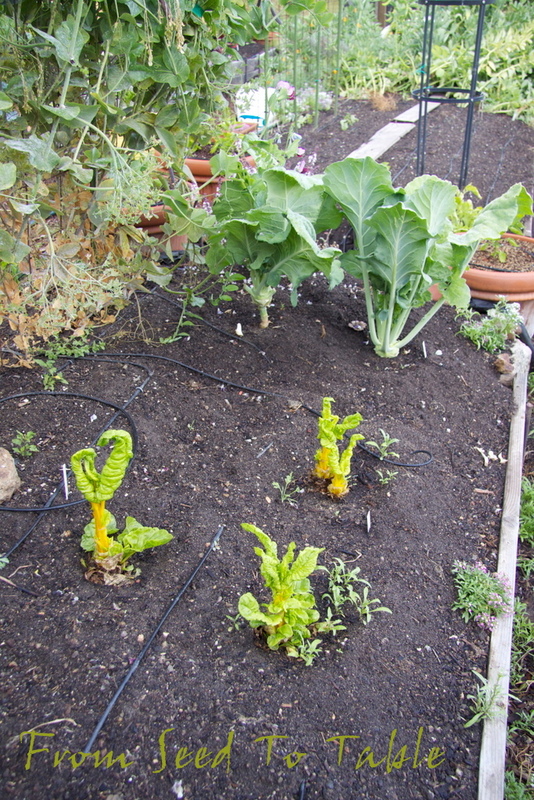 And here's the transplanted Gigante kohlrabi and Golden Chard. 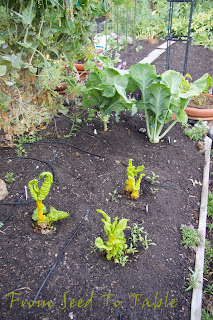 The chard is bolting and I need to pull it out but haven't had a chance to yet. 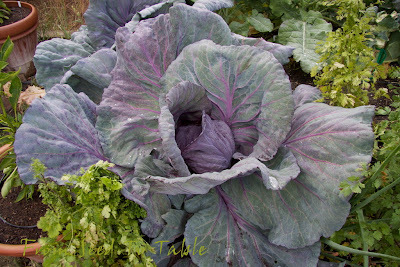 The kohlrabi is taking forever to form bulbs, I don't think I'll bother with this variety again. 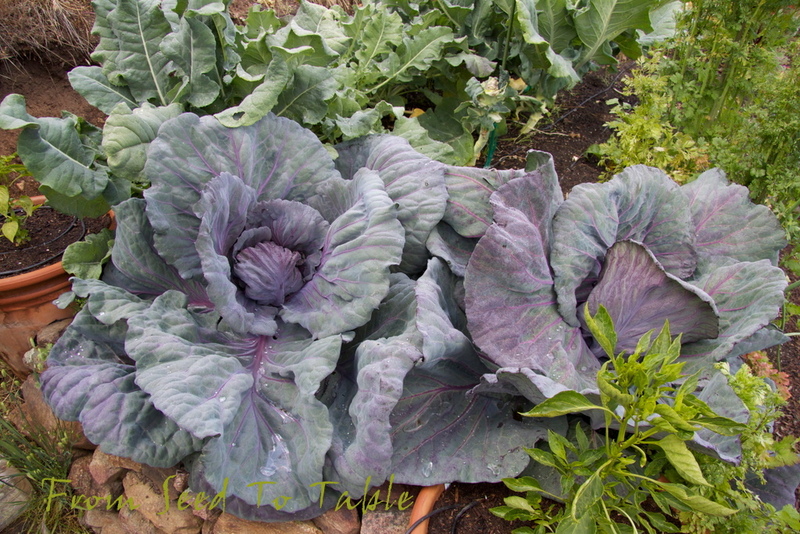 The Azure Star kohlrabi sized up much more quickly, was more beautiful, took up less space and tasted good. I hope I can find a new source of seeds for it. 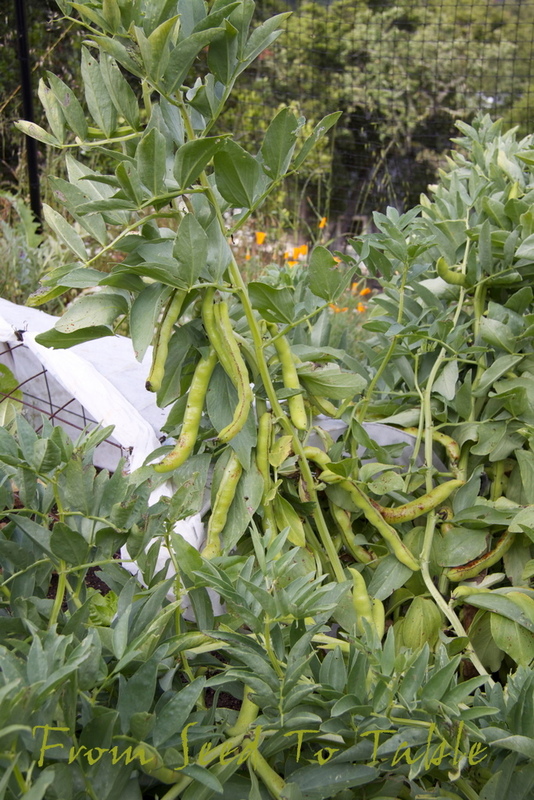 The next bed is home to the last of the fava plants which are full of maturing pods. I got tired of shelling and peeling after harvesting over 100 pounds from the first planting of beans so I'm letting these beans dry on the plants. 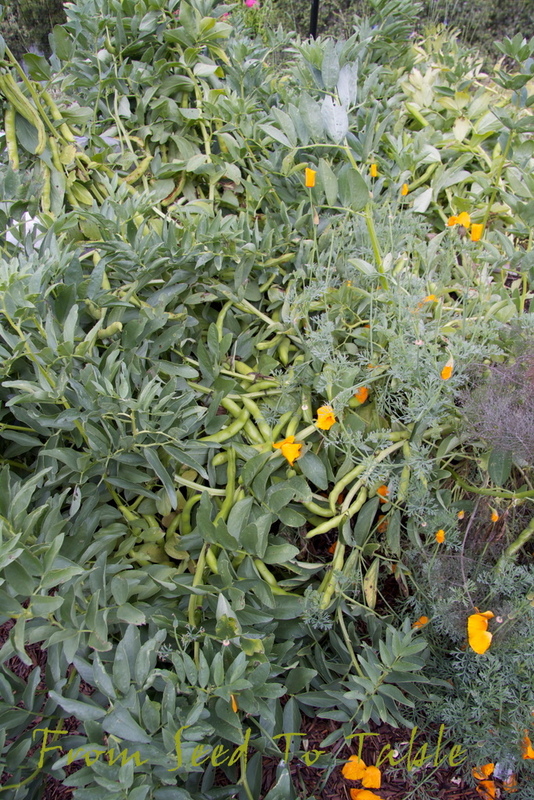 There's a good example of how many pods set on one stalk. Next to the beans is the last of the lettuce. 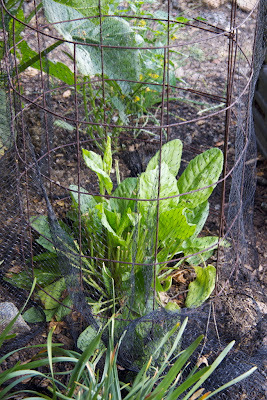 There's three heads of fully mature Noga romaine which have been surprisingly good considering their size. But then, we've not had any heat to make them bitter. 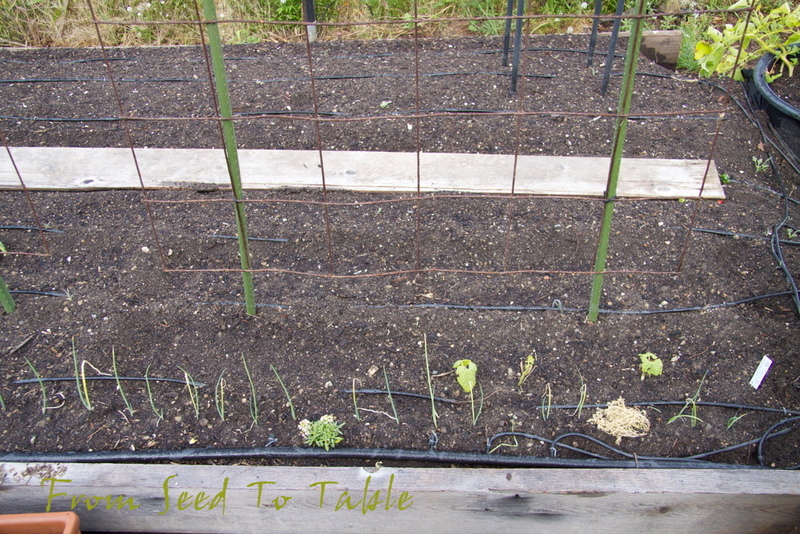 The butterhead and Cimmaron lettuce are resprouting from the stems that I cut down to soil level. Maybe I'll get enough to make a salad. 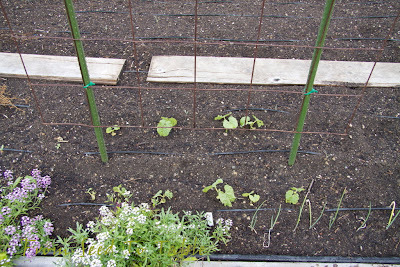 And in the other end of the bed where the first planting of favas used to be is the miserable planting of beans. Only 3 of the Garafal Oro romano beans sprouted and they look awful. The Petaluma Gold Rush Beans were a bit tougher (like the 49'ers that they fed once upon a time), but they still look awful also. I've gone back to my more reliable method of sowing the seeds in paper pots and have a flat of pots hopefully sprouting for a second try. 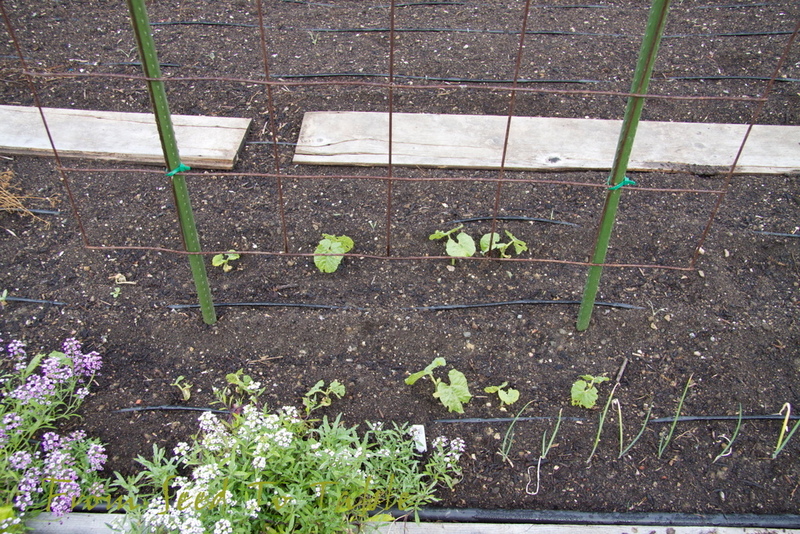 The rest of this bed is reserved for cucumbers and zucchini which are being started in 4-inch pots and nearly ready to be planted out. That's Piracicaba broccoli to the left of the cabbage, 4 plants. 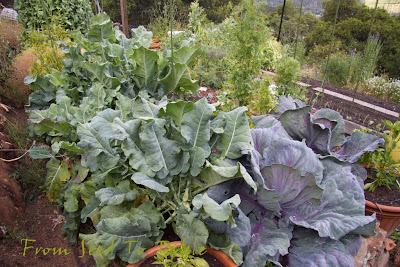 And the taller brassica in the center is Romanesco Natalino. There are 2 out of the original planting of 4 left and are nearly ready to harvest. The Romanesco is supposed to be a smaller variety but this is ridiculous. The Natalinos have been very disappointing, producing very small heads (12 oz and 7.5 oz so far) on huge plants. They are not worth the space they are taking up. Perhaps they are buttoning, but they really haven't been subjected to conditions that normally cause buttoning. I'll stick to my summer sown, winter maturing full sized Romanescos. 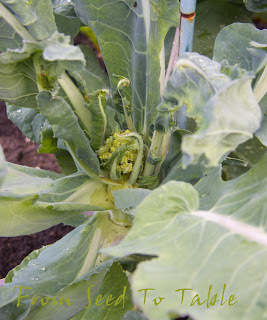 The one shown below is a bit funky looking also, it may have had some aphids early on but I can't find any in there now. The last head is a little larger and prettier than this one but too difficult to photograph. 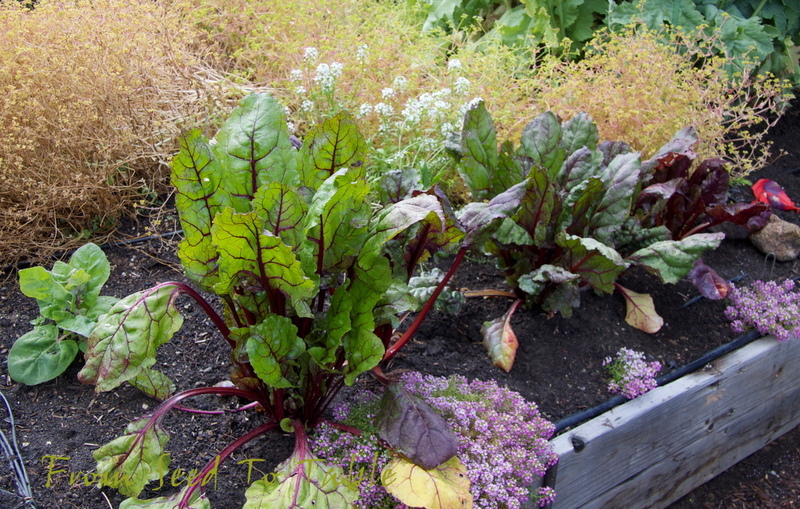 Here's the last of the beets, these are an heirloom variety called Devoy. Their roots have been very slow to size up but they are beautiful plants. I think they'll be ready to harvest soon. 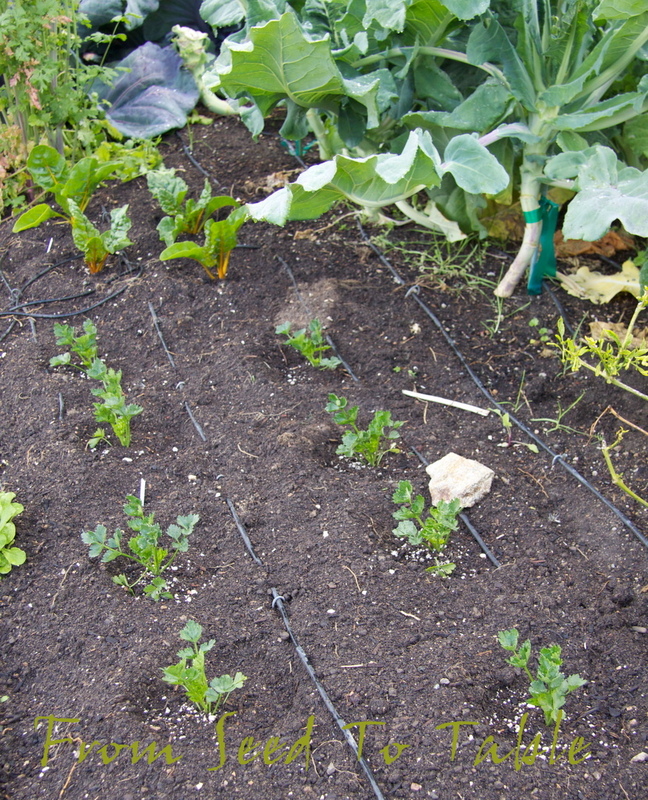 Newly planted out Golden Chard and Diamante Celery Root. And newly planted Hollow Pipe of Malines Cutting celery. 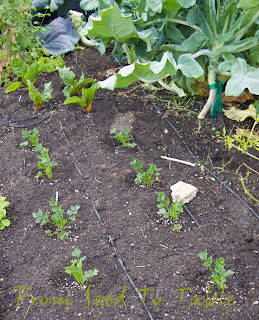 This celery produced really well for me last year and I expect this planting to do even better. 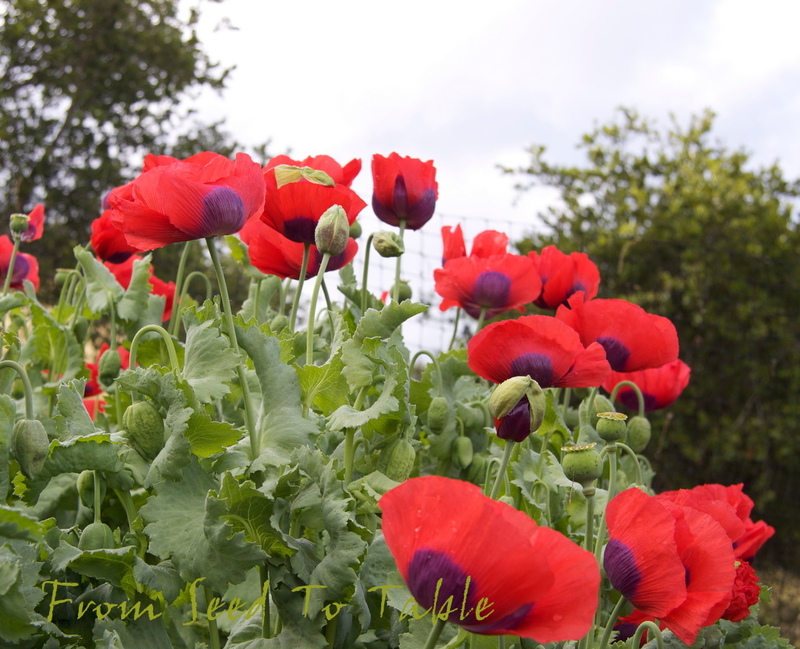 Last year I didn't thin my plants and planted them too close together to boot. 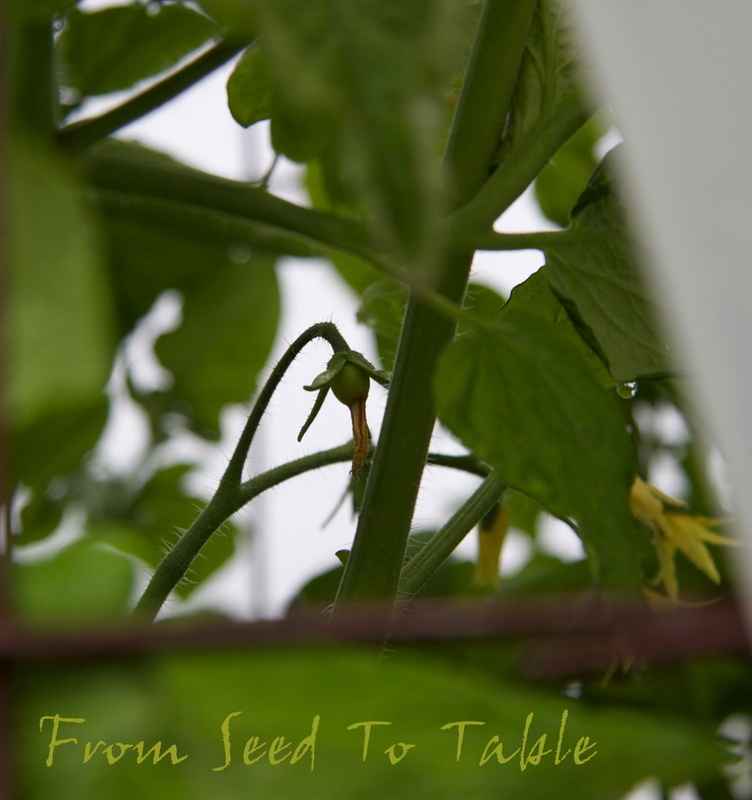 This year I thinned and gave them more room, let's see what happens! Those red petals were from the real star of this bed . 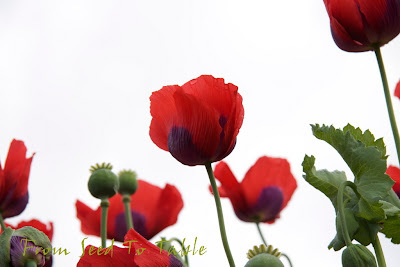 . .
Monticello Poppies in full bloom (thanks Christina!). They are at least 5 feet tall right now. 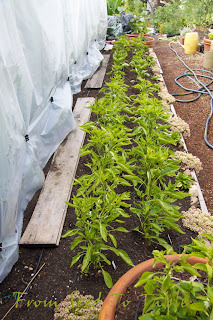 That wispy stuff at their feet is the ready to be pulled and bagged for seeds but they're too wet because it's been *raining* Golden Corn Salad. I took too many photos of the poppies to able share them all, but here's a taste. 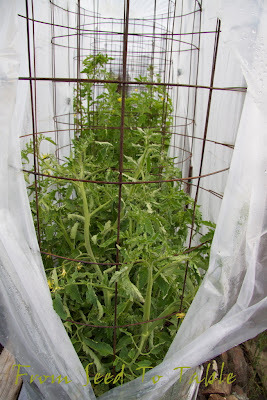 The tomatoes are still living undercover because of the continuing cold nights and cool days. They are coming along very nicely. Here's my tomato bed on May 28, 2009. I got a much earlier start this year. 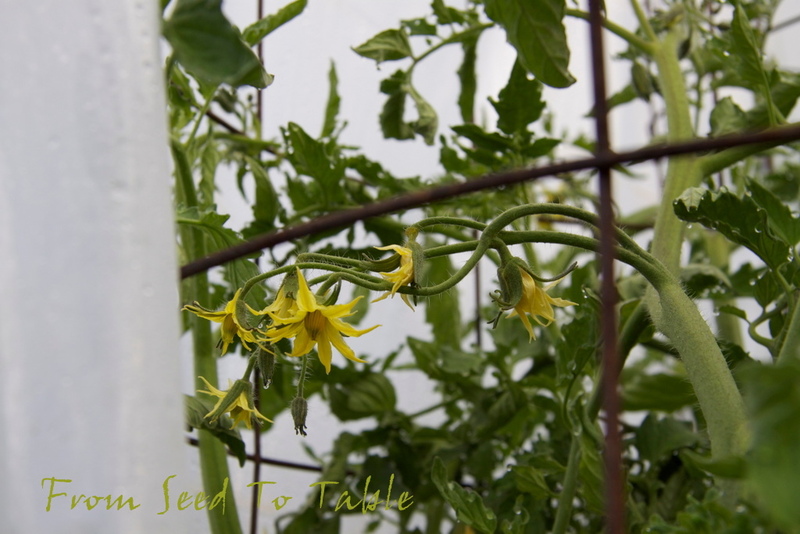 Here's the first tomato that I've found on the Katja plant. But lookie here! Now this is really exciting. 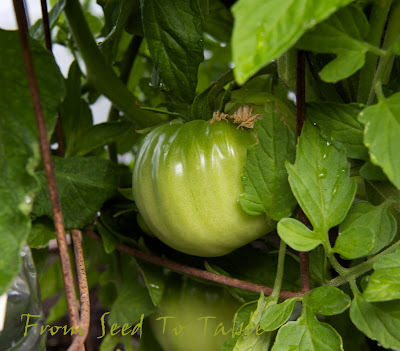 That's a baseball sized tomato on the Gigantesque plant and there's another one that's just slightly smaller behind it. And the first tomato on the Galinas cherry plant. Looking into the tomato enclosure from the other end. I haven't seen a tomatoes on these Andine Cornues yet. 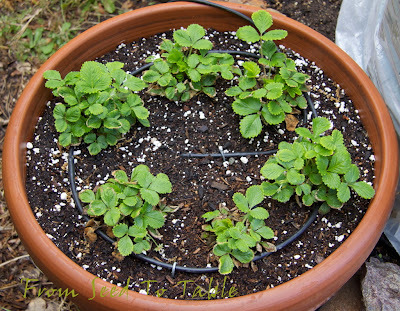 The Yellow Wonder strawberries seem to be recovering from my earlier neglect. The pepper plants are growing, slowly, they are resenting the cold weather. 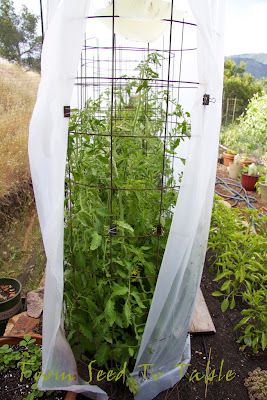 Maybe next year I'll try covering them like the tomato plants . . . 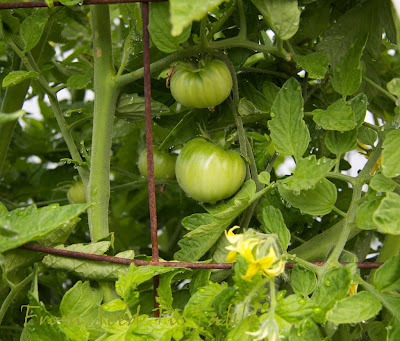 But some are setting fruit. Here's a Chorizero pepper (thanks Teleri!). 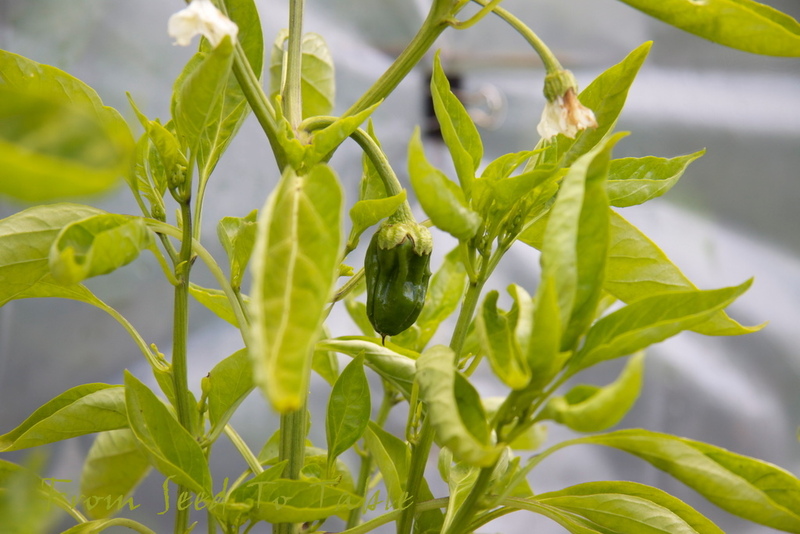 And the first (of hopefully many) Pimento de Padrons. That's it for this tour, I hope you enjoyed it. 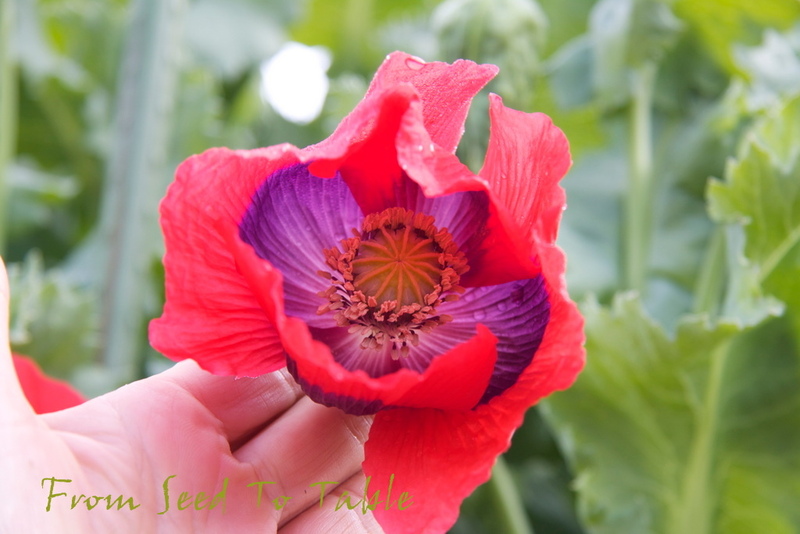 Here's something new and unusual from the garden this week. 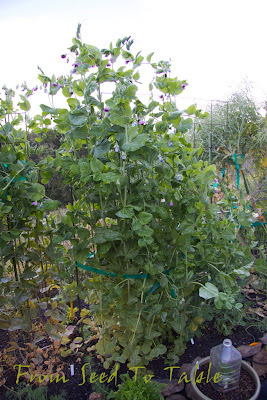 The peas in the photo above are the first picking of the Sugar Magnolia Purple Snap Peas. Most of the plants are turning out all purple pods, but one plant is producing green pods and one other one is producing green pods with purple blotches. Unfortunately, I can't tell you how they taste yet. We were going to eat them last night and then had a menu change. Tonight was supposed to be the night but 'round about 3:30 this morning I woke up with a stomach bug that has been quite persistent and the thought of eating continues to be rather undesirable. I'm thinking that what I need to do when my system is less rebellious is to stand in the garden and sample the various peas and choose the plants with the tastiest and most purple pods for seed saving. So, you'll be hearing more about these purple beauties in the future. 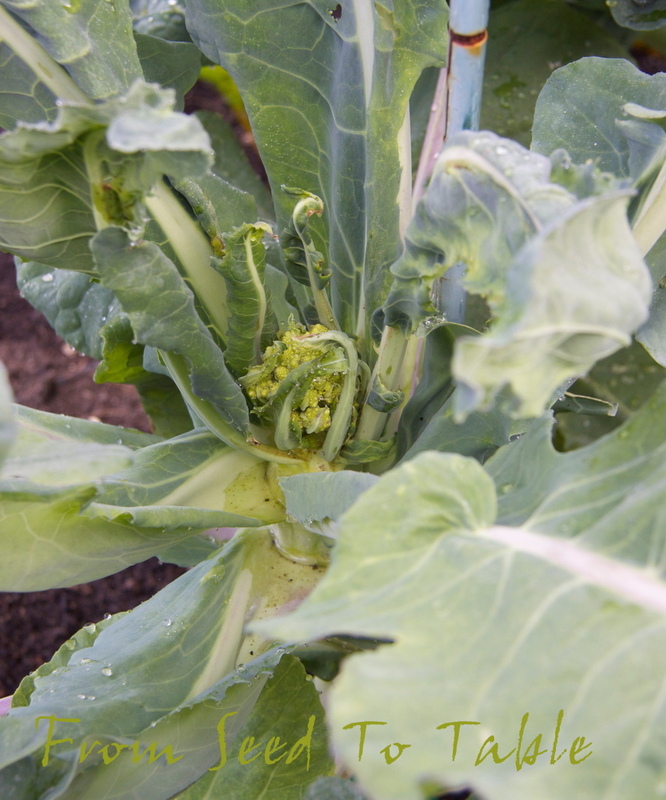 The Golden Chard survived being transplanted and was starting to produce some lovely leaves and then it started to bolt. 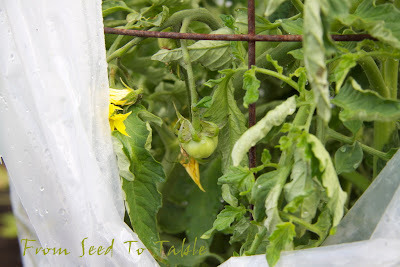 So I harvested all the leaves and the plants will be pulled out. I've got some nice replacement plants going already, I figured the old plants would bolt, it just took longer than I thought. 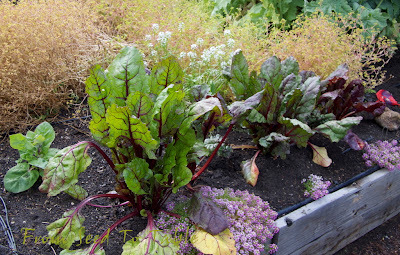 I also harvested all the beets except for the Devoys. I made 3 quarts of pickles with them and saved 2 to roast for beet salads. Yesterday this jaunty gal stopped by the finch feeder. 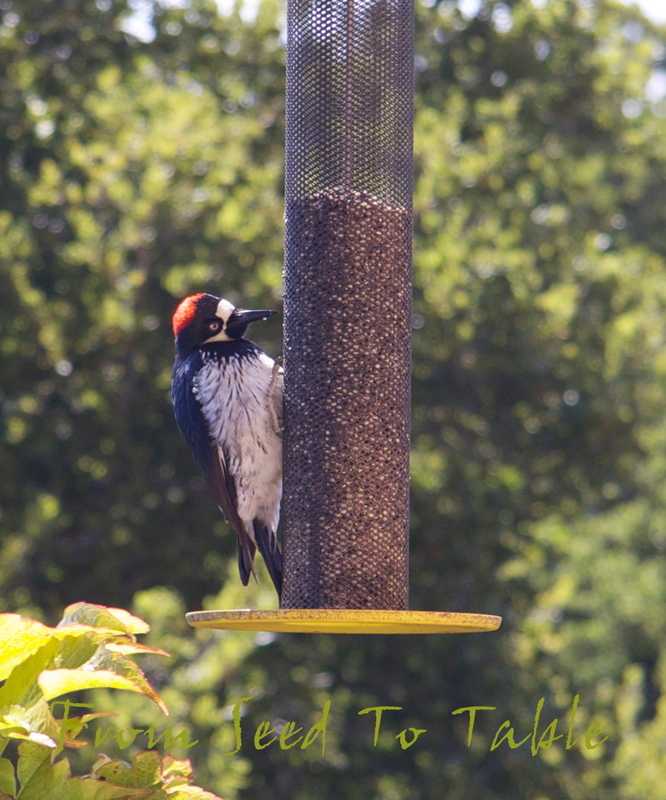 I think she's an Acorn Woodpecker, they are quite common around here. She's got a nest bursting with chicks that is easy to keep an eye on in an oak branch nearby. Here's the rest of the harvest for the past week. Burpee's Golden Beets - 1 lb., 5 oz. Chioggia Beets - 3 lb., 5 oz. Renee's Golden Beets - 2 lb., 15 oz. Piracicaba Broccoli - 5.5 oz. Golden Chard - 1 lb., 12 oz. Green Garlic - 7.75 oz. Garlic Scapes - .75 oz. 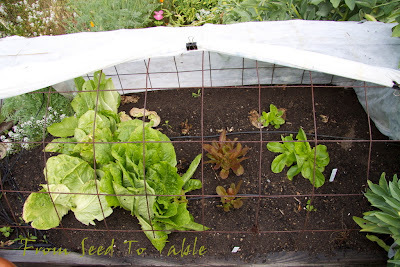 Butterhead Lettuce - 6.5 oz. Noga Lettuce - 1 lb., 5.5 oz. 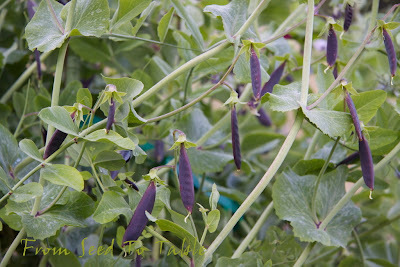 Sugar Magnolia Purple Snap Pea - 3.5 oz. Romanesco Brocccoli - 7.5 oz. Total for the week - 13 lb. 10 oz. Total for the year - 205 lb., 6.75 oz. 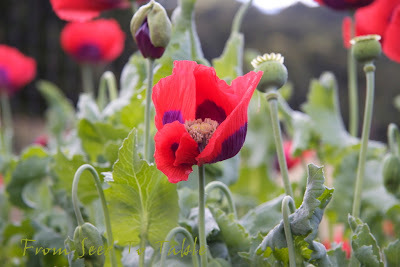 There are lots of harvests to ogle on Harvest Monday at Daphne's Dandelions, head on over there and check it out. This caper plant is growing in a 17-inch diameter terra cotta pot. 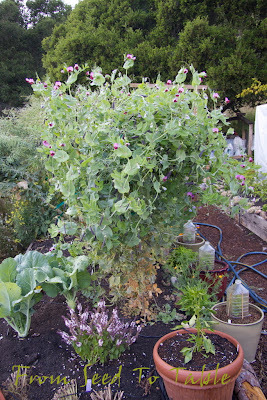 It's one of my best producing pot-bound plants and it has beautiful pink flowers if I allow it to bloom. I grew this plant and a few other ones from seeds that I got from a member of the Seed Savers Exchange who lives in Siena, Italy. 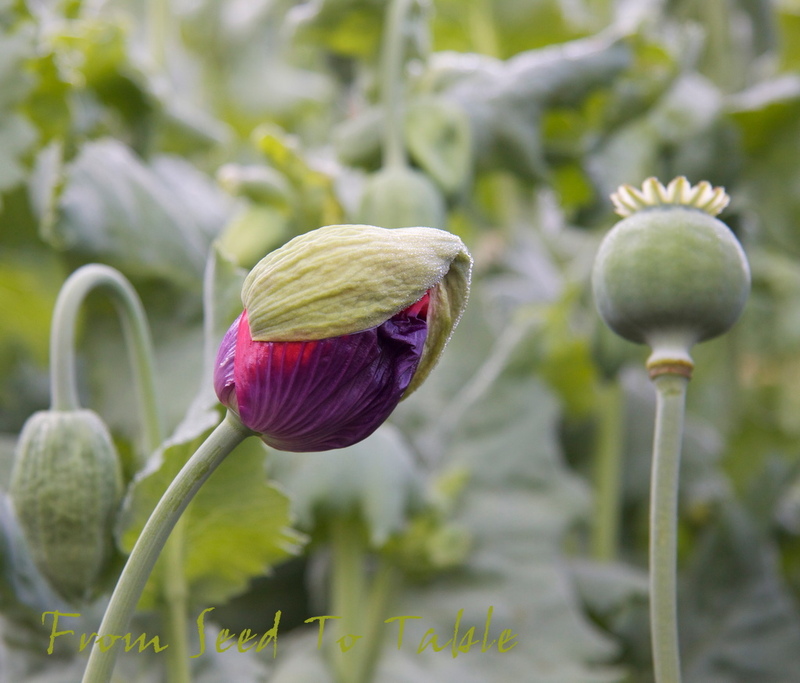 There is a fair amount of variation in the plants from this seed source and this plant is unusual because it has pink flowers. 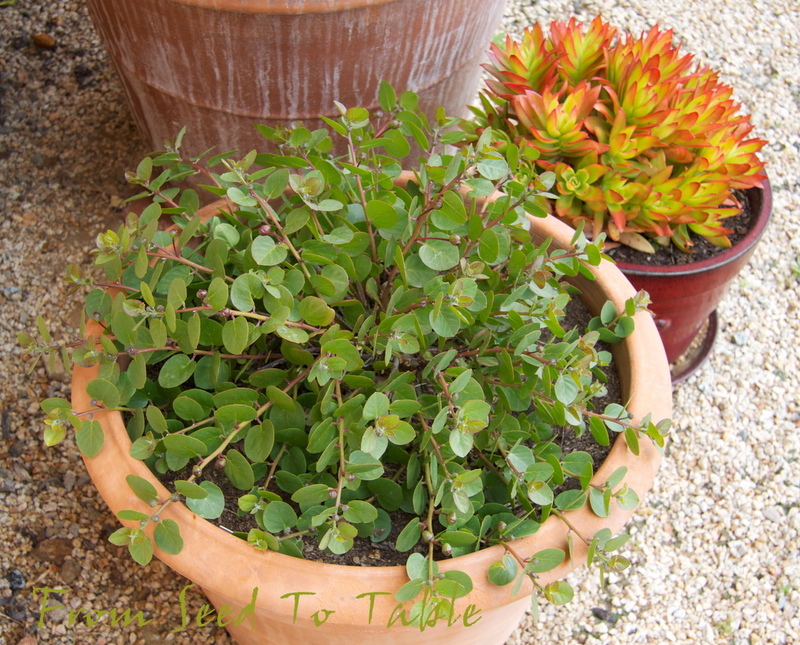 My other Sienese caper plants are also in large pots but they are in a colder part of the garden and haven't grown as much as this plant yet. 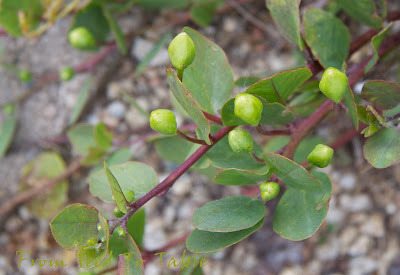 The buds on this plant also produce a fair amount of nectar before they open. The droplets you see on the buds shown below are nectar. My most productive plants are a Croatian strain from the island of Hvar. 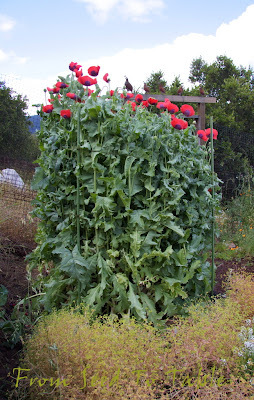 These are growing atop a wall that has another wall rising above about a foot behind it. It's a very sunny and protected spot. The buds on the Hvar capers are larger than the Sienese capers. 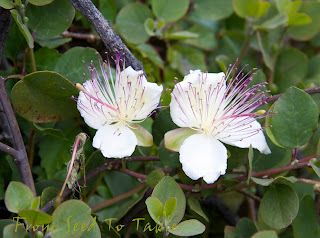 These plants don't go fully dormant and the most protected branches start blooming very early. The flowers on the Hvar capers are typically white with purple stamens and have a lovely soft fragrance. Here's the caper buds that I picked today. 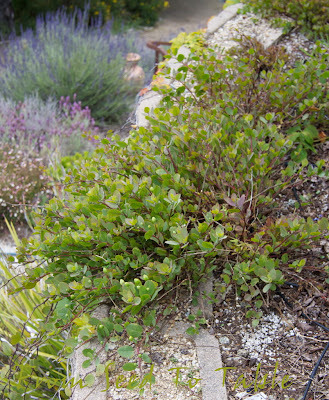 These are the Hvar and Sienese buds mixed together. I netted 1 ounce of buds without the stems. 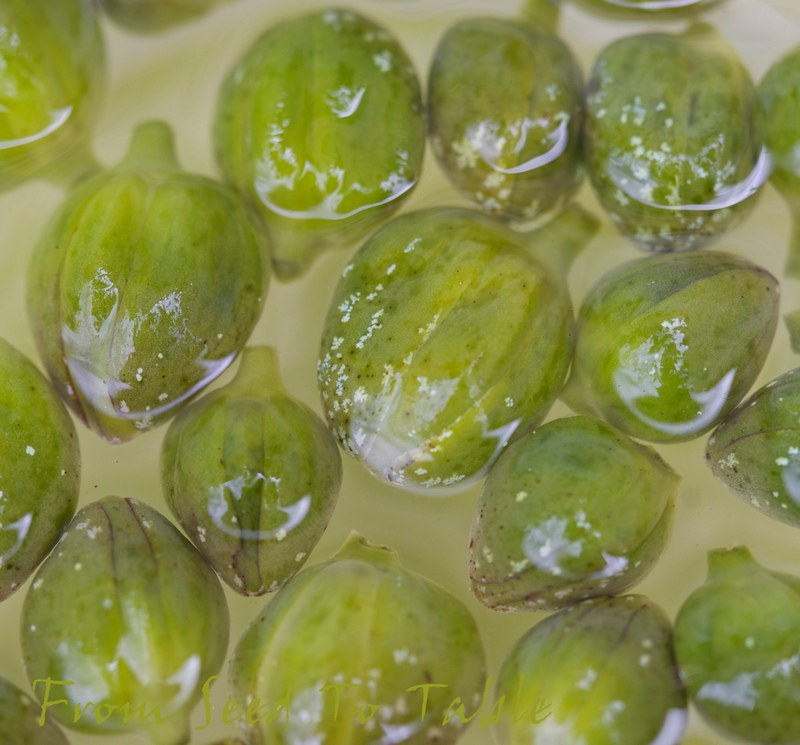 Today's picking of raw buds are shown above and the buds from last week are shown below floating in the brine that they are curing in. Raw caper buds are bitter and horrible tasting, they must be cured to make them tasty. 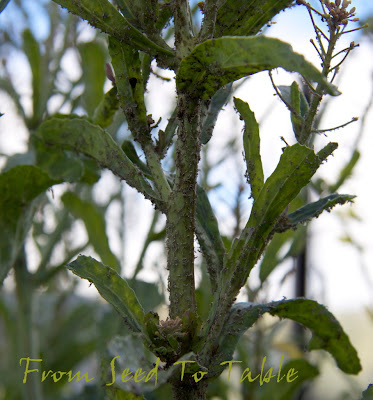 You can see some spots that are developing on the buds below, that's a good sign, they are rutin crystals that form when mustard oil is released during the curing process. 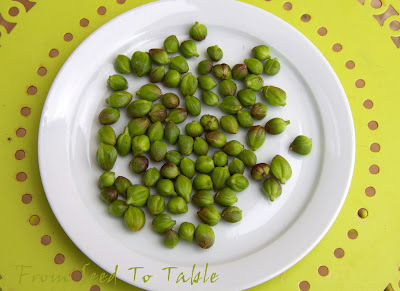 Here's the method that I've developed for curing capers. I make a brine of 8 ounces filtered water and 1 1/4 ounce kosher salt for 2 to 2 1/2 ounces of buds (that's the most I harvested at one time last year). I keep the capers at 55F for 4 weeks and change the brine weekly. They can also be kept in the refrigerator during the curing process but that will take longer since the colder temperature will slow things down. 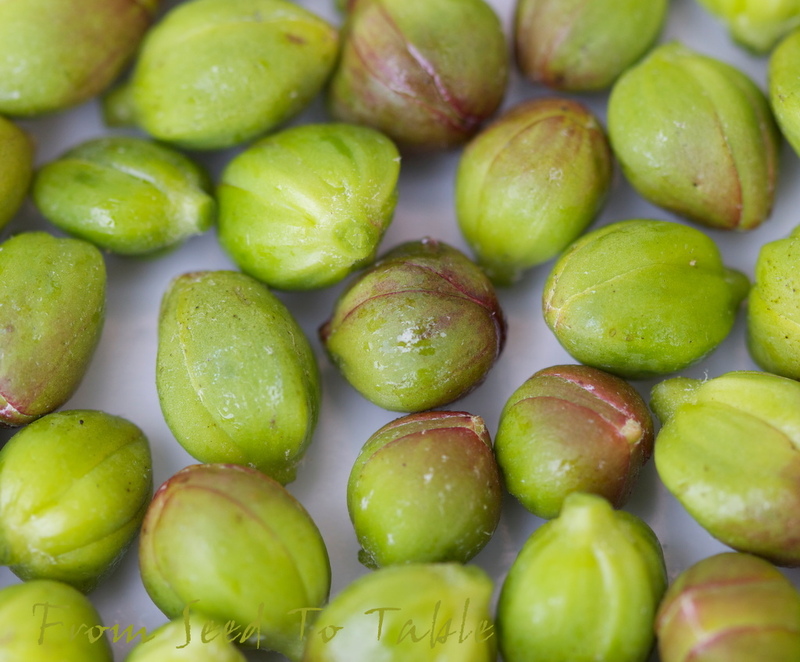 At the end of the curing period I drain the buds and either pack them in coarse salt or dry them. 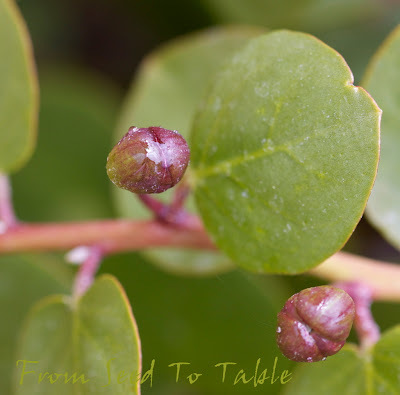 You can read about my experiments on the post that I updated with each caper harvest last year, although I did get lazy about documenting the details towards the end, but you can still get an idea of what I did. You can find a link to that post on my side bar. 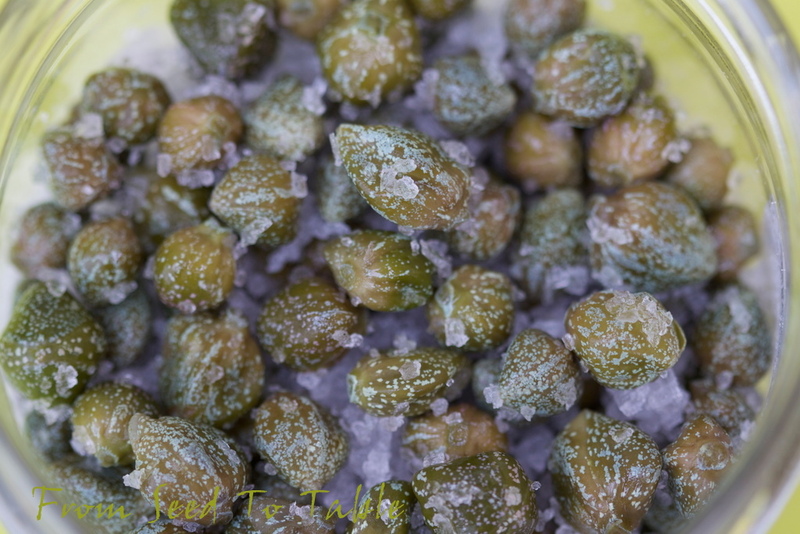 Below are shown some salt packed capers from my harvest last year (I can't believe I made them last this long). They keep for a long time in the refrigerator. I usually rinse the salt off and soak them in fresh water to remove even more salt before using them. This final photo is of the last of my dried capers from last year. I experimented with sun drying and found that the capers turned brown like the ones below. When I dried them in a warm shaded spot or indoors they stayed greener. Either way, green or brown, they are equally delicious. 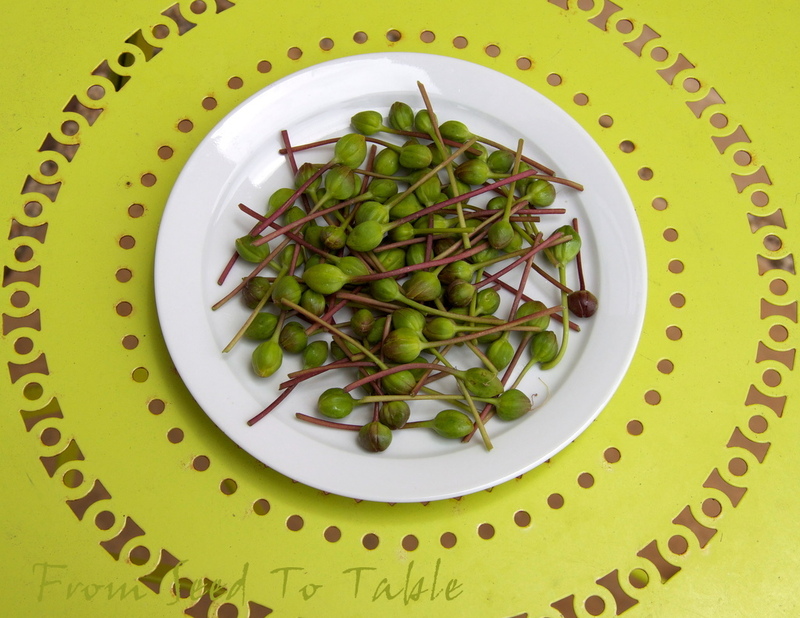 The dried capers keep well at room temperature. 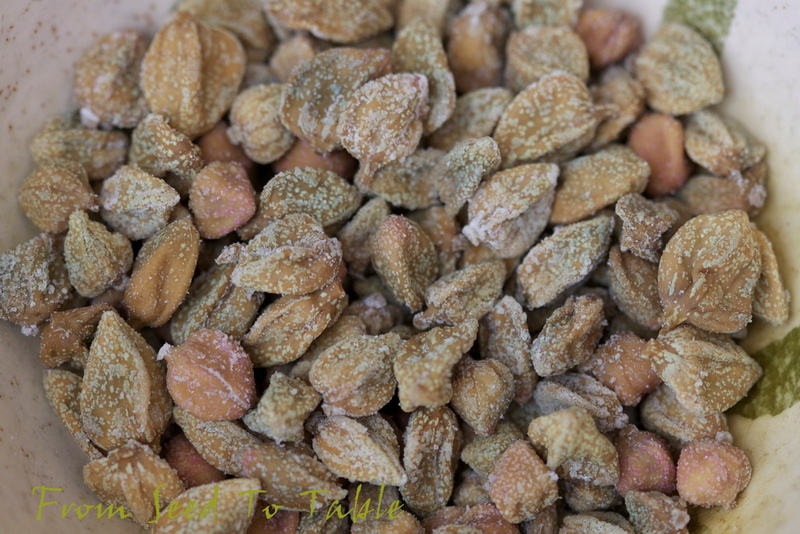 I like to chop the dried ones without rinsing them and incorporate them into dishes to add a salty capery flavor. They are also quite delicious eaten out of hand, although I find them too salty to eat more than a few. Another wonderful way to eat them is deep fried, oh yum.